LFW is heating up as big designers are approaching the catwalk. Here is a sample of some of my favorite looks from day 2 of LFW. 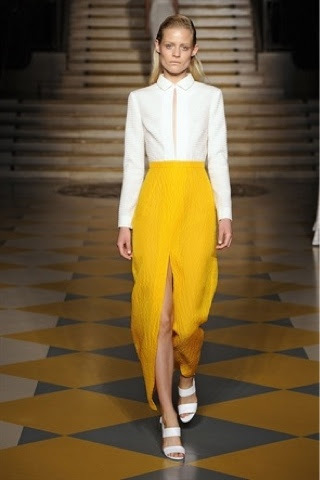 I really liked Emilia Wickstead's collection because it represented bright colours such as whites and yellows. I also noticed how the colour choices were shown on the tiled flooring which I thought was a clever way to present new pieces. Antipodium is a smaller brand compared to others you see amongst the catwalk, however their pieces are cute and preppy. I feel like the outfit below would be great for every day and I LOVE the long duster coats, especially the light pink one as it adds to the spring vibe. Orla Kiely's pieces are very bright and fun loving, bringing old to new with the high waisted skirts and cute peter pan blouses. I loved her background at the catwalk also as it added a less serious vibe compared to other designers and thought it matched perfectly with the teen-sleek outfits. From swinging crop tops, too basic sandals, Holly's collection was effortlessly fab. 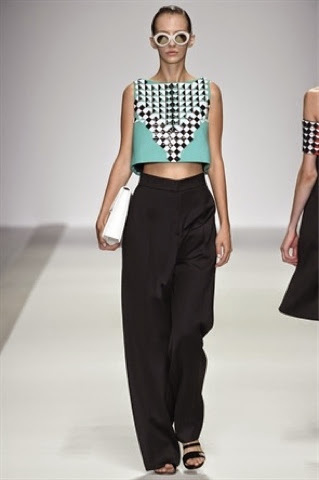 I loved the 'funky' pattern on the crop top, featured below, as it was a unique combination with the cold print on a pale blue background. 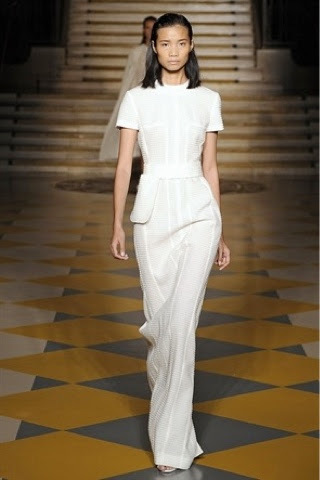 I also loved how sophisticated the models looked, very 'Victoria Beckham'. Julien Macdonald, can I just applaud you through my computer screen. The style, runway, makeup choices and obviously the outfits were breathtaking. The amount of detail on each individual item was amazing alongside the accessories and shoes. My favorite is the third one below, the detail, the glitz and glamour was right up my street and I'm positive many others. Clearly the show stopper however was the wedding dress (fourth below), featuring lace, crystals and sheer panels will make anyone want to head down the isle. Great review, Amy. My favorite is Julien Mcdonald's collection which featured many elegant pieces. I was impressed by the use of yellow and orange in some of the collections. I enjoyed Preen's and Topshops shows so much. Thank you, Julien Mcdonald's collection was my favorite also, thank's for commenting.